September 20: Having decided to take a zero day in Silverton, I slept in late then worked on Atlas Quest and Walking 4 Fun all morning. After being offline for nine consecutive days, I had a lot of catching up to do! I checked the weather forecast and Friday and Saturday were looking even worse than they did the day before. Now it was predicting up to two inches of snow on Friday and four inches on Saturday--six inches total! And that was in town, not in the mountains where I'd be hiking! 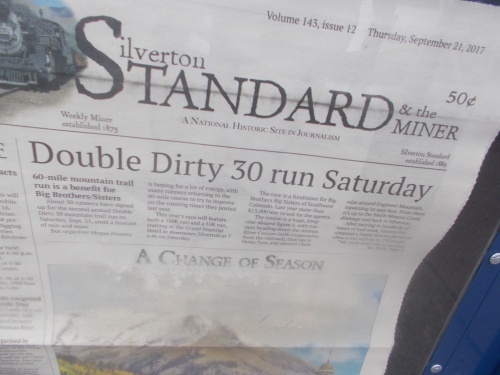 To be fair, Silverton is one of the highest towns in the entire country with an elevation of 9,318 ft (2,840 m)--but the mountains I'd be hiking in were typically in the 11 to 12,000-foot range. Silverton has just one paved road--and Blaire Street isn't it. =) The whole town looks like the set of a western. I had pretty much resigned myself to the idea of waiting out the storm. I just didn't have the gear for it. Worse case, it could kill me. Best case, I'd be absolutely miserable. It was Wednesday now, though, which meant I had to take four consecutive zero days to wait out the storm. 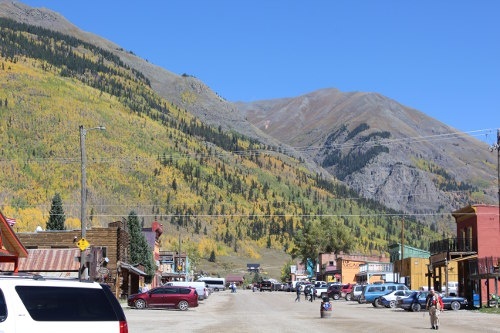 Five nights, four days in Silverton. With a total population of 630 people, the town isn't exactly a bustling hive of activity. At least I had a laptop to get a lot of work done which I figured should keep me busy. The forecast for Sunday showed a little snow in the morning but clear the rest of the day. So far in the future, though, I knew the forecasts could change. And I needed at least four days to get from here to Durango. There was no forecast that extended far enough to show the weather through the four days after the storm. It was too early for that. For all I knew, another storm might blow in two days after this one passed, so I still couldn't be sure when--or if--I could get back on the trail. In any case, I was off the trail for at least four zeros days. By the time Saturday came, I should have a better idea of what the weather would be like for the next week and make a decision about what to do. In the meantime, though, I was stuck in Silverton. After working all morning, I figured it was time to explore this little town that was to be my home for several days. I went out for lunch where the streets were packed with people and one of the old steam trains was parked in town. It was the first time I got a close-up view of the magnificent machine. The old 1880s steam train is a hugely popular tourist attraction! I ate lunch--a burger and fries, nothing exciting--then wandered to the edge of town where there was a museum. I paid the $8 entrance fee and was led into the old Silverton jail--a fascinating place where the jail cells looked more like cages that one could walk around in rather than the cell blocks I've seen in every other prison I've been to. To my surprise, though, the museum then led downstairs to a basement area which then connected to the main museum building. Half the museum was actually underground! It was vastly larger than I had realized when I walked up to it! And the exhibits were absolutely amazing! They even recreated an actual mine spanning several levels that was startling life-like given that it's inside (and under) a building. I was absolutely blown away at the extensiveness and quality of the museum. I had admittedly set my expectation pretty low not thinking that a small museum in a town of 630 people would have much to offer, but WOW! It is really a top-notch museum and worth far more than the $8 entrance fee! The museum is hidden behind this courthouse at the edge of town. I spent a few hours going through all the rooms and exhibits. 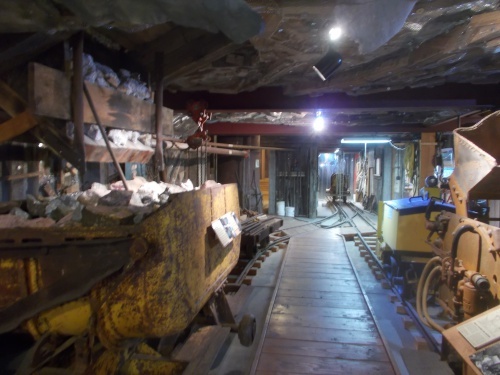 The biggest chuck was dedicated to all things mining since mining is what built the town in the first place, but it also had information about early photography, potbelly stoves, railroads, and more. The last half hour I rushed a bit realizing that the museum closed at 5:00 and I might not be done before then. I had no idea I would spend so much time there when I arrived. Looking at the size of the buildings from the outside, I figured I might kill an hour going through it. Maybe two if I went slow and had a lot of information to read. I never imagined I'd be there until closing! But I stuck with it until the end at 5:00, my only regret was that I didn't arrive earlier so I'd have even more time to explore all the exhibits. I headed back into town and was surprised to see the streets absolutely deserted. The place felt like a ghost town, which seemed strange when it had been so packed to the gills with people before I went to the museum. Where did they all go?! And that was when I realized how utterly dependent Silverton is on the tourist train. People had told me that the town wouldn't exist without the railroad, but I kind of wrote it off as an exaggeration. When the last train left, though, taking the vast majority of the tourists in town away, all of the shops set out their 'closed' signs and closed shop for the day. A few bars and restaurants were still open, but even most of them had closed their doors for the day as well. The main tourist street turned into a ghost town. All it needed was a tumbleweed to blow through the street to finish the effect. The hours of the shops had clearly been synchronized to the train schedule. They open when the first train arrives, and they close when the last train leaves. There were two trains that ran each day, although I heard later that earlier in the summer they would run three of them each day. I walked over to the local general store--which fortunately was still open (probably because that's when the townspeople could shop now that their shops were closed!) and picked up some chips and dip that I'd turn into nachos at the hostel. 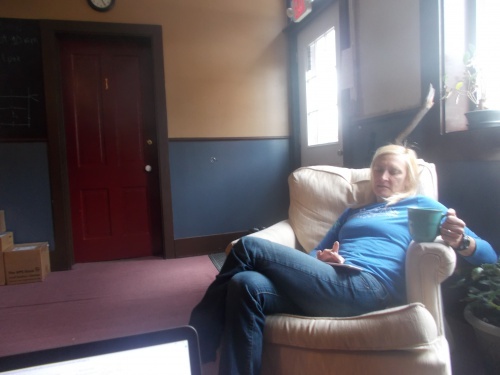 Nicole relaxes in the lobby of the hostel. While I was in the museum, Jan--the proprietor of the hostel--had moved me to a different room. She texted me about it when a couple of people reserved the entire room that I had been in. I didn't mind the move, though, and was moved into a room with Kevin, a thru-biker who had been riding his bike from Denver to Durango. We didn't chat much that night, but I'd see a lot more of him while in town. Also arriving into town was Bushwacker who I had last seen at Marshell Pass over a week ago. He seemed surprised to have caught up with me thinking I was long since gone. Nope.... He was assigned the same room as Kevin and I making a nice, happy group of three. Also arriving were the Indiana boys who I traded stories with, but they were put in another room. It was fun seeing familiar faces walking into the hostel, though. Nicole told us a bit more about the run she was scheduled to do on Saturday--and freaking out over the snow storm that was supposed to hit that day. She won her entrance into the race and felt compelled to do it, but was very worried about the weather. I joked that at least we didn't have that problem--we could wait out the storm and start hiking again whenever we wanted to. The race was a crazy one too, called the Double Dirty 30. I'm not sure why it's called that, though, because the race included a 55-kilometer and 100-kilometer route (or about 34 and 62 miles respectively). And it's not an easy route over flat terrain. No, much of it was up in the mountains, on the Colorado Trail, going up and down gigantic mountains at high altitudes. And, just because that wasn't enough, they decided to throw in the snow storm that was expected to dump several inches of snow on the city and even more in the mountains in gale-force winds. Sounds like fun--not! "And people think we're the crazy ones," I joked. I couldn't imagine the horror of hoofing it over SIXTY FRIGGIN' MILES in a single day, much less on such a rugged route through a blizzard! Nicole was "only" doing the 34-mile run, but still--THIRTY FOUR MILES?! My longest day on the trail was a measly 23 miles, and I was exhausted. Yeah, okay, I carried a heavy pack, but I didn't have to go through a snow storm so let's call it a wash. I told my story about my own concerns about the weather, which is why I decided to sit out the storm and figure out if I'd keep going or not after it passed. I didn't really have the gear for snow camping, I explained, not even carrying a pad to sleep on. Nicole, who had driven in from Los Angeles, had a lot of camping and backpacking gear in her car and offered to lend some stuff to me that she didn't need--not in the immediate future, at least--as long as I promised to mail it back to her when I was done. Definitely! Which is how I ended up with with Nicole's sleeping pad and sleeping bag liner. The liner might add a few extra degrees of warmth to my sleeping bag, but the pad would be worth its weight in gold. My biggest concern was that I'd be up in the mountains and not be able to find snow-free ground to camp on. I might be okay with sleeping on a cold, hard ground, but I drew the line at sleeping directly on snow. My body heat would melt the snow and I'd just sink in and never be able to get warm. A pad gives me the power to sleep on snow--or rather, just above it with an insulating layer. This pad, I declared, may have just saved my hike! It was getting late and everyone else started heading off to sleep. I stayed up in the lobby and worked on my laptop when, at around 10:30 at night, a guest checked in fairly late. No big deal. Jan took care of them, they headed off to their room, and Jan left. Then Jan came back a couple of minutes later. "Ryan, could you help me for a bit?" she asked. "Sure," I replied. "What did you need?" "I locked myself out of my room." Jan stayed in a room upstairs so she was always nearby, but I wasn't sure how I could help her. "I'm going to crawl through the window, but I need someone to hold the ladder steady," she explained. Without street lights, most of the streets of Silverton were very dark! Jan left and returned with a full-sized ladder, and we stepped out into the quiet, dark streets of Silverton. It was dark too. Most of the streets didn't have street lights lighting up the street. Heck, the street wasn't even paved. She leaned the ladder against the building, right in front of the front door and started climbing up. I held the ladder steady as she ascended and kind of hoped a cop would happen by to ask us what we were doing, but I didn't imagine that a town this small would have a cop on duty. But maybe it does? The town might be small, but it is the only incorporated town in the county and it is the county seat of government. They might have one guy around to keep the peace. No cops showed up, though, and Jan slid open the window and started crawling through. My last sight of her was her feet dangling out the window, kicking, which looked like something out of a comedy sketch. She unlocked the door and descended back down the steps to me to put the ladder back, thanking me for my help. No problem, I told her! It was worth it! I really wished I had a photo of her feet dangling out that window, though. I didn't think to have my camera ready. I continued working on my laptop, eventually crawling into bed at around midnight. Day 1 of the Silverton Zeros was officially over.